The Honor 5X from Huawei is a very good mid-range smartphone that has all the good features and strong metal body. The device indeed is one of the best in the price range and the performance too is decent, after testing it for a few days. The phone has a 5.5-inch display with the Full HD resolution and along with that, there is Qualcomm Snapdragon 616 octa-core chipset powering the phone. There is a camera combination of 13-megapixel rear and 5-megapixel front-facing camera. 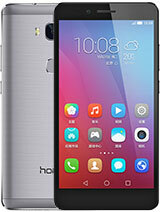 There is a 3000 mAh battery also packed into the Honor 5X, and the phone has a fingerprint scanner for the additional security. Check below for the full list of specifications of the phone. The Huawei Honor 5X is a good mid-range phone but it does have some heating issues and the performance too sometimes isn't up to the mark, otherwise this is a great contender in its price range.